with the years came more swimming, and tree climbing, jumping off big rocks into water, and everything active and physical. that was MY THING. that's what i was good at. i was given a strong body and a desire to WIN! i disdained anything that was "girlie." no cooking, no sewing, none of that girl stuff. [i love all that stuff now, but then, no way josé.] my mom wasn't so inclined either, which didn't bode well for me learning any homey skills. anyway, i was all tomboy, and happily so. our neighborhood was full of kids playing out on the streets, and i played with all the boys and one other tomboy girl. chase. tag. kick the can. then later football, basketball, baseball. once in awhile the boys wanted to play with only boys, which i totally get now. but at the time it was devastating. and just made me work harder to be better at sports. in middle school PE class, we girls had to wear navy blue sleeveless jumpers with little attached skirts and with bloomers underneath, a bit like a tennis dress without the cute factor. humiliating. title IX legislation was passed in 1972. equal opportunity for boys and girls in high school and collegiate sports. 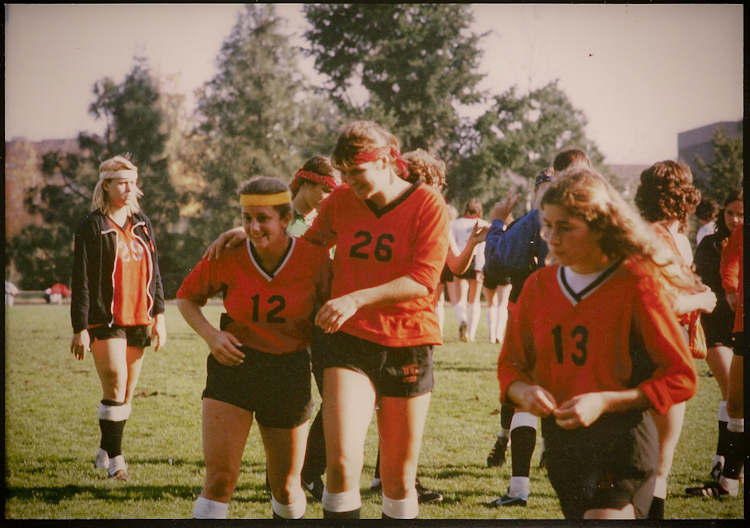 soccer had come to the west coast when i was about 12 and i got on the first local girls team. we played against the boys and held our own. our coaches were all men. one coach, a british man, quit on us right before a game! we were talkative, rowdy, inattentive. we were preteen girls, for god's sake, what did he expect?! he had no clue how to handle a gang of girls. we kept playing because we loved it. running around outdoors after a ball with a bunch of kids = pure freedom. at lewis & clark college in portland, oregon, i stuck with my true love: soccer. my three roommates helped me get psyched up before games. we'd dance on our desks and sing queen's "don't stop me now" into our hairbrushes. my team played in the fog and the rain and the mud and the glorious sunshine. travelled all over the pacific northwest in the autumn and saw leaves turning for the first time in my life. hillareeeeee, hillaraaaaaaah, with handball in the box! at the end of my junior year, we found out that the college washed the men's varsity team uniforms. but not the women's. a couple of us questioned the head of the women's athletic department who fumbled her words and replied, "we always thought the women preferred to wash their own uniforms." hah! yeah, with all our spare time in college, we'd rather wash our own uniforms ... not! so several of us on the team decided to make a statement. my senior year on the soccer team, we decided to NOT WASH our uniforms all season long. only two of us made it the whole season, sheila and i. we did not wash our shirts, shorts or socks. not once. after playing in the mud and muck, i'd throw my uniform onto a piece of plastic i laid out in my room and not pick it up again til the next game. i'd have to put on stiff-with-dirt socks and all. gross. and i think our teammates and coach weren't thrilled for us to begin a game in dirty clothes. but since i had seen so much unfairness in the world since i was little, i was committed to my cause. at the end of the season, sheila and i placed our dirty uniforms in brown paper bags with a note and left them on the doorstep of the women's athletic director. we asked that the women be treated equally with the men. we asked that all the women's varsity teams have their uniforms washed by the school, just like the men. and lo and behold, the following year, the year after i graduated ... lewis & clark washed all the women's uniforms! who knew the most political act i would ever commit would be on a soccer field? lessons learned: go with what you've been given. play fair. do right.